When the inspiration hits you to buy New Order shares, you go with it. Myevil Gankalt knew it was her time. 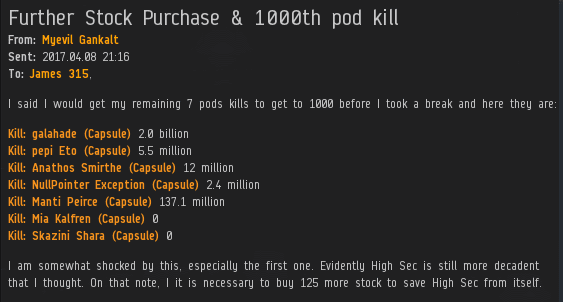 Upon podding her 1,000th client, she bought 125 additional shares, which sent us just past the 1,169 billion isk mark. Myevil earns a Supreme Protector's Tip of the Hat™ and, I assume, the respect of the 1,000 people she podded. Dmitry Hareka also increased his supply of New Order shares this week. 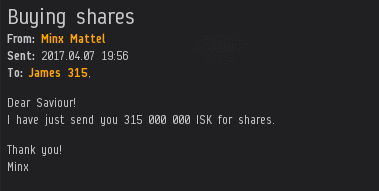 By purchasing 2,000 additional shares, he sent us beyond the 1,170 and 1,171 billion isk marks, earning him a Double Supreme Protector's Tip of the Hat™. Quick thinking! When the inspiration hits you to buy New Order shares, you go with it!